MANILA, Philippines - The Department of Science and Technology (DOST) through the Science Education Institute (SEI) officially announced today, March 8, 2015 the names of the S&T scholarship qualifiers or passers of September 2014 exams for AY 2015-2016. DOST said that total number of passers of the Scholarship Program for 2015 reached an all-time high as 5,303 high school students clinch a slot in the country’s premier science scholarship program. This year’s qualifiers breached the 3,982 mark of last year’s passers, up by 33 percent, a record for the scholarship program established in 1958. Out of the total number of passers, 4,475 qualified as scholars under the RA 7687 Scholarship Program, scholarships for gifted students who belong to economically disadvantaged families; while 828 passed under the DOST-SEI Merit Scholarship Program. Municipalities and congressional districts covered by the DOST-SEI Scholarship Program has also increased from 1,443 last year to 1,568 this year with the inclusion of 125 municipalities having DOST scholars for the first time. Moreover, incoming DOST-SEI scholars, as well as those who are ongoing, are set to receive bigger stipends and other allowances starting school year 2015-2016. All DOST-SEI scholars will receive P6,000 monthly stipend (from P5,000) under the Physics/Applied Physics, Geology, Mining Engineering, Agriculture, and Fisheries courses, while under the other DOST-SEI priority courses will receive P5,000 monthly stipend (from P4,000); book allowance of P10,000 per academic year (from P5,000); tuition fee subsidy of P10,000 (from P8,000); and MS/PE clothing allowance of P1,000 (from P500). 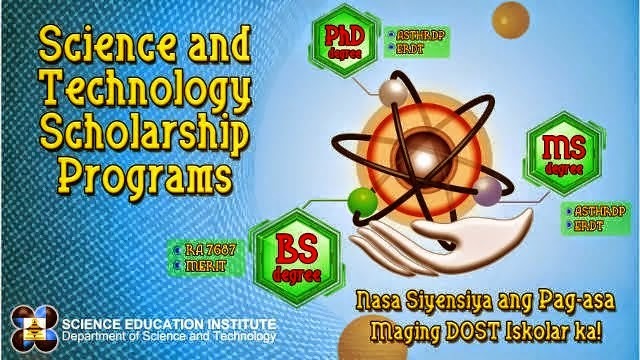 DOST Secretary Mario Montejo said the scholarships will certainly allow the students to pursue their dreams in their desired fields in science and mathematics in leading universities and colleges and will ultimately lead them to become key players in the country’s development once they practice their professions four or five years from now. The scholarship qualifiers can enroll in state universities and colleges and other higher education institutions recognized by the Commission on Higher Education as Centers of Excellence or Centers of Development, wherein they can take up priority science and technology course such as Agriculture, Agricultural Biotechnology; Agricultural Chemistry; Agricultural Engineering; Applied Mathematics; Applied Physics; Biochemistry; Biology; Ceramics Engineering; Chemistry with Applied Computer System; Chemistry with Materials Science and Engineering; Chemistry Engineering; Chemistry; Civil Engineering; Computer Engineering; Computer Science; Electrical Engineering; Electronics and Communications Engineering; Environmental Science; Fisheries; Food Technology; Forestry; Geology; Geodetic Engineering; Geological Science and Engineering; Industrial Engineering; Information Technology; Manufacturing Engineering; Materials Engineering; Mathematics; Mechanical Engineering; Metallurgical Engineering; Mining Engineering; Molecular Biology and Biotechnology; Physics; Physics with Applied Computer System; Physics with Material Science and Engineering; Science/Mathematics Teaching and Statistics. With the implementation of the K-12 Curriculum, there will be a two-year hiatus in the selection of new scholars under the RA 7687 and the Merit Scholarship programs since there will be no high school graduates in 2016 and 2017. To fill this gap, DOST-SEI shall be opening more slots in its other scholarship programs such as the Fast-Tracked Science and Technology Scholarship Program under the RA 10612 and the regular Junior Level Science Scholarship Program. Dr. Josette T. Biyo, DOST-SEI Director, said these programs will provide greater opportunity to those who would want to become a DOST scholar as they pursue a college science degree but is hard up in life. “I believe that with our junior level scholarship grants we will be able to sustain the production of a critical mass future S&T expert at a desirable rate,” Biyo added. DOST-SEI scholars are required to render service in the country along their fields of specialization after graduation for a period equivalent to the number of years they enjoyed the scholarship as a return service. SEI maintains its resolve that this strategy allows the country’s industries to have “the best minds” to do their services and products. Each qualifier shall receive a notice of award from the DOST-SEI or DOST Regional Office stating the date of orientation and contract signing. He/she shall report at the designated venue with a parent/legal guardian who must bring a 2015 Community Tax Certificate or Passport. The legal guardian is required to submit his/her notarized affidavit of guardianship. The new scholarship awardees must seek admission in any of the priority S&T fields of study at state colleges and universities and CHED-identified Centers of Excellence/Centers of Development. ANICETO, SONNY BOY PAHILANGCO, JR.
CAGANG , JOSELITO BIADNES, JR.
CARDOSA , JAIME GONIDA, JR.
DELA CRUZ, ANTONIO MANOSCA, JR.
DELOS REYES , DARWIN BOMBAHAY, JR.
MOHAMAD JR., EBRAHIM BALADING, JR.
QUILOQUILO , FRANCISCO NERI, JR.
RODRIGUEZ, EVAN WILSON CAMALLERE, JR.
TAGUM , MANUEL BUSTARGA, JR.
TECSON, ROMEO DELA CRUZ, JR.
TUASON, RAMON DEXTER RUBIO, JR.